An extension of the Florence tramway’s T1 Leonardo line has been inaugurated by mayor Dario Nardella in Italy. 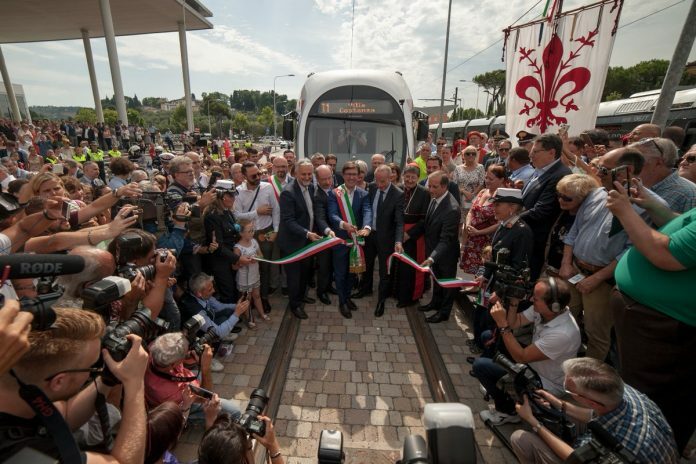 The line now connects Villa Costanza to Careggi University Hospital via Alamanni after four years of construction work. As a result, T1, which opened in February 2010, is 11.5km-long with 26 stops and trams at six minute headways during peak times. Florence’s political leaders are working with operator GEST to reduce this to a four minute headway. Mayor Nardella said (Translated from Italian): “Today is an unforgettable day and party for Florence and the Florentines. It is to them that I say the first thanks because patience, trust and tenacity have prevailed over everything else. “We have won against skepticism, against the principle, the problems of bureaucracy, technical difficulties. GEST general manager Jean-Luc Laugaa added: “We are proud and honoured by the trust placed in us by the city of Florence and the Florentines. GEST (51 per cent owned by RATP Dev and 49 per cent by ATAF) has trained 40 new drivers as a result of the tram extension. Passengers can use the new section of the network for free until July 29.